Setting up an area in your house for your baby shouldn’t stress you out or break the bank. While I will agree that it is fun to pin nursery ideas and pick out a theme, there are ways to do this that are easy and budget friendly. I’ve included some tips and ways to save so that you can spend money on where it counts…(hello birth and/or newborn photos!) Scroll below and read on, mama! So everyone who loves Hobby Lobby knows that they have a bunch of different items that go on sale weekly, BUT did you know that they have a set rotation for these sales?? Ummm I didn’t. I would just go at random crossing my fingers that what I wanted would be discounted and if not I would just use my 40% off coupon. That coupon could only be used for one item though…boo. I had NO idea that they stuck to a set schedule for discounted items until a client told me that is how she decorated her whole house. #mindblown. 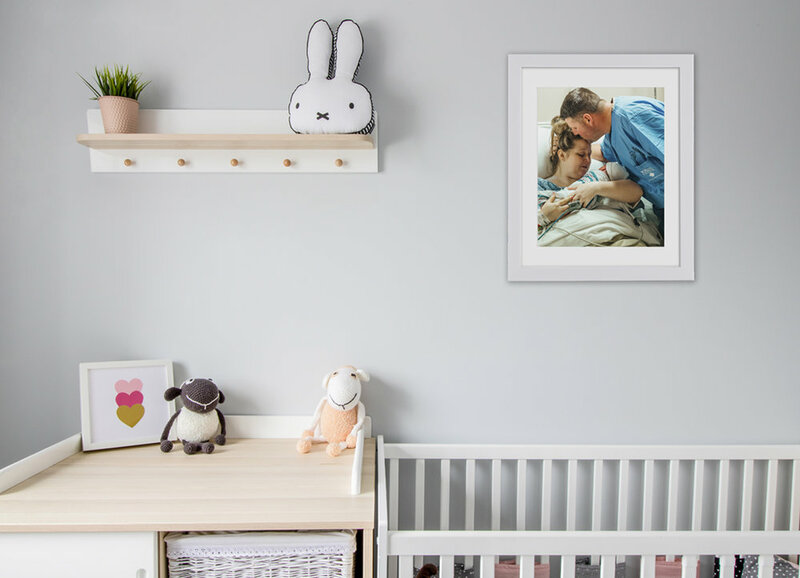 So, if you love that cute elephant wall display, along with all of that elephant themed nursery decor know ahead of time when you will get the best deal, and check for the rotation! (furniture or fabric), you can ask a cashier to void the sale price and ring it up at full price. Then hand over the 40% coupon and you’ll have saved yourself an additional 10%. If you are a local here in town and you haven’t been to Bargain Hunt off of Watson, you are missing out! While sometimes it can be hit or miss, when you do hit, it’s a good one! My mother in law has found some super awesome deals for her house, numerous friends have gotten bigger baby items, and we have gotten our daughter some last minute decor and curtains from there. A lot of their items are leftovers that Target didn’t sell (my daughters curtains + curtain rod.) If you aren’t local then check out stores in your town that are similar. Sooo consider saving money and skipping out on a changing table. If you just HAVE to have one though you can either A) check out that yard sale down the street or B) find a dresser that you can use as both storage and a changing space. If your sister, sister in law, or close friend recently had a baby they would be a great resource to reach out to, don’t be ashamed either mama! Borrowing some of the extras — like a baby swing, bouncy chair, play yard or bassinet — can be a huge money-saver. Remember, not all items have to be brand new for your baby. As long as there is no recall on used items you can for sure save a ton of money this way! Also, once your baby outgrows the borrowed items you can kindly give back, freeing you from having to store them and taking up space in your home. If you love yard sales and a fun project this is a great way to find nursery side tables, a dresser, rocking chair etc. Instead of getting a super teeny dresser, side table or bookshelf buy furniture that they can continue to use after they turn one. Check out convertible cribs, which convert to a toddler bed and grow with your baby. This obviously will save you money as you won’t have to buy another bed until later on. Choose furniture that’s either multipurpose or can transition from the nursery to a child’s bedroom or that you can even use in another room in the house. You can also look for cribs with storage drawers or shelves, storage ottomans, and gender-neutral items you can save for another child. The less crib bedding, the less furniture, the less money! Less is more when it comes to putting together a nursery and buying baby gear. The idea is to only buy items you love and truly need. Don’t go big on lighting either. Babies’ eyes are sensitive, so bright, harsh lighting should be avoided, especially when you’re winding down for bedtime and naps. Put those big, MUST HAVE, items on your registry. Let your guest know to please only stick to what you have on your registry rather than adding on clothes and other stuff that you really do not wish to have. You can also let them know that you have booked a birth/newborn photographer and that money towards that is also welcomed! This is also a good idea if you have a birthday coming up and someone ask you what you want. As always I hope this was helpful and I’d love to hear some feedback from you! Drop me a comment down below and let me know your thoughts! Hospital Bag Must Haves From Local Moms in Warner Robins, Georgia. I love these ideas and I want more session information! Best time of the day to respond to your e-mail?